Academia's hard plastic school chairs are made to withstand all the everyday abuse your super-energetic students can throw at them. Their 16-gauge MIG-welded tubular steel frames and 14-gauge steel continuous-tube back supports make them unbelievably strong, while a 3/8" chrome-plated X-Brace and self-leveling glides provide added safety and stability. Thick scratch- and stain-resistant seats ensure that these classroom chairs will look great even after many years of use. 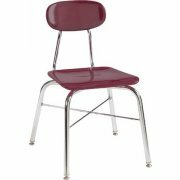 These hard plastic student chairs are designed for the convenience of students, teachers and school staff. Their ingenious gooseneck design enables them to be securely stacked upside down on desks, making it easier to clean the classroom. 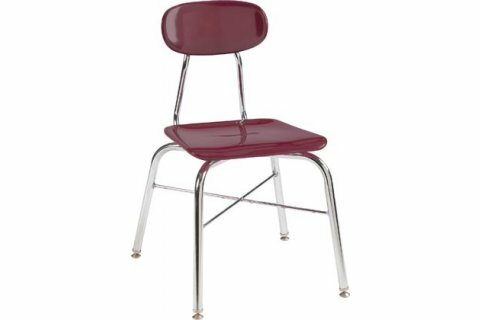 Our powerhouse of a school chair also comes with a chrome-plated frame which complements a wide choice of seat colors. Tough Build: Hard plastic resists scratches and stains, so seats will look great even after extensive use. Extra Sturdy: 16-gauge steel frame provides superior support , with a 3/8” X-brace for added stability. Comfortable: Seat back is contoured for extra comfort. Convenient: The gooseneck design allows chairs to be securely stacked on top of desks for floor cleaning. Attractive: Available in a selection of vibrant and subdued hues which can be coordinated with classroom decor.